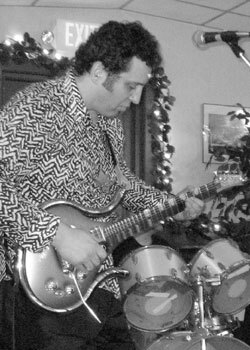 Conrad is a New Yorker and guitarist with 3 piece band Agents of Karma (AOK)...an exciting outfit which he iniitally described to me as 'Cream meets The Police'. By his own admission he has a 'semi-disregard for convention' - possibly why he became attracted to the G1 MIDI! - which has led him to experiment with a wide range of techniques, including fretless guitar, Ebow, two handed tapping and computer based music. He's studied with an impressive 'who's who list' of top guitar innovators, including Vinnie Zummo (Joe Jackson Band), John Berenzy, Steve Khan, Bill Connors, Dave Fuiczynski (Screaming Headless Torsos), Vernon Reid and Hiram Bullock. A High School Maths teacher by profession, Conrad sometimes brings his love of music into the classroom and uses guitar, Theremin, synthesizers and an oscilloscope to enhance the students' understanding of his subject!...Oh to have had maths teachers like that at school!